With our new hotel opening in Dallas in 2019, we’ve spent a lot of time in the “Big D”; and if there’s one thing we’ve learned, it’s that it has a little something for everyone. Incorporated in the 1840s, this young city is famous for its place in both culture and history. It’s home to the Dallas Cowboys (and the equally-popular Dallas Cowboys cheerleaders), it’s where JFK was assassinated, it has some of the nation’s best BBQ, and now, it’s home to the largest contiguous arts neighborhood America has ever seen: the 19-block, 68-acre Dallas Arts District. We took some time to explore this district and find out why art lovers across America are talking about it. Read below to find out what we’ve learned. The Dallas Arts District we know and love today was 30+ years in the making. Dallas has always had an impressive arts community, but it wasn’t until the mid-1970s that city leaders began looking into ways to really make it shine. At the recommendation of consultants, city planners relocated and scattered major arts institutions to the northeast end of Downtown Dallas, starting with The Dallas Art Museum in 1984, and named the area the Dallas Arts District. This move sparked a gradual, 30-year citywide shift that led to the addition of Pritzker Prize-winning architect I.M. Pei’s Morton H. Meyerson Symphony Center, Crow Collection of Asian Art, Pritzker Prize-winning architect Renzo Piano’s Nasher Sculpture Center, Booker T. Washington High School for the Performing and Visual Arts, AT&T Performing Arts Center, Moody Performance Hall, Klyde Warren Park, Perot Museum of Nature and Science, a slew of restaurants, bars and art galleries, and so much more. It was designed to be a haven of art, culture and learning. Dallas Arts District is packed with award-winning art and science museums, performance venues, gardens, restaurants, bars, art installations, galleries and more. Nasher Sculpture Center, which houses 300+ pieces by Picasso, Matisse, Rodin and more, has one of the foremost collections of modern and contemporary sculpture in the world. Italian architect Renzo Piano, the genius behind the Whitney Museum in NYC and the Shard in London, designed this indoor-outdoor museum-turned-park as a place to both learn and hangout; it regularly hosts artist talks, lecture programs, contemporary chamber music concerts and artist-led classes for all who are interested. Science lovers of all ages can go to the Perot Museum of Nature and Science, where they’ll find exhibit halls dedicated to topics like sports, animals, gems, minerals, birds and dinosaurs. Get both a taste of art history and a spiritual awakening at the Cathedral Santuario de la Virgen de Guadalupe, the city’s oldest Catholic parish and a prime example of High Victorian Gothic architecture. After a day indoors, get outside and enjoy Dallas in all its glory. Much like Brooklyn’s High Line, the 5+-acre Klyde Warren Park hovers over a major freeway and has everything from food trucks and a library, to dance classes, community yoga, special events and jaw-dropping city views. Catch a local band at Sammons Square, and follow it with a stroll to One Arts Plaza. When you do, step inside to see the lobby; its canvas of 24 55-inch plasma TVs is the largest digital art installation in North Texas. Whatever you do, don’t miss the annual Block Party. Every summer, the Dallas Arts District shuts down the streets for one of the hottest block parties in town. This free soirée has food trucks, pop-ups from local brewers, guided tours of the district, artist talks, outdoor movie screenings, family-friendly games and events, and photo booths where you can capture the night. Last year’s fête had street performances by Tauvy Thompson and the Bandan Koro African Drum and Dance Ensemble, jazz by Thaddeus Ford Music and even a New Orleans-style second line parade. 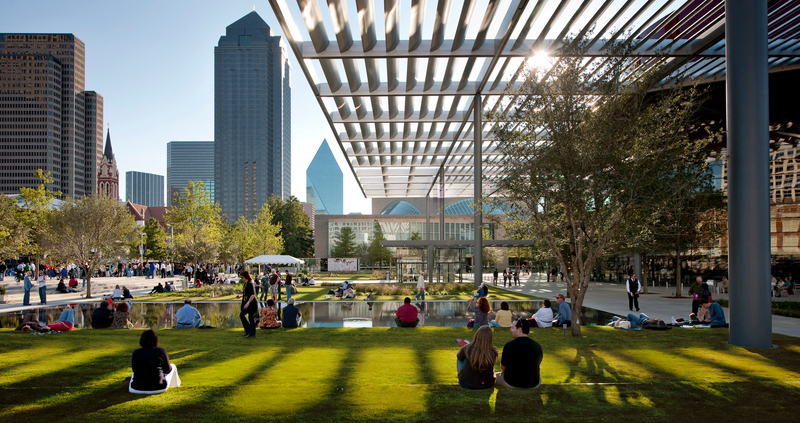 There’s always a dance party at Klyde Warren Park, while Nasher Sculpture Garden welcomes a slew of romantic picnic dates. Sounds too cool to be true? See it all for yourself. There’s so much to learn about the Dallas Arts District, and the only way to really understand it is to take a guided tour. The district offers 90-minute architecture walking tours that take you through masterpieces from the 1800s to now, honor the visionaries who created them, and examine how the Dallas arts community impacts the city today. Watch Virgin Hotels Dallas construction time-lapse video. For more information about the Dallas Arts District, or to purchase tickets to any of its museums or events, click here. Reservations are required for both public and private tours. Public tours take place at 10 a.m. on the first and third Saturday of every month, and start from the ceremonial entrance to the Dallas Museum of Art. Tickets for adults stat at $5 and can be purchased here. To schedule a private tour, call 214.744.6642 or e-mail kristinakhart@dallasartsdistrict.org.